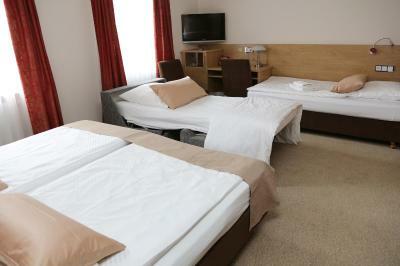 Lock in a great price for Hotel Lindleinsmühle – rated 8.1 by recent guests! The funny location in a residential neighbourhood. The restaurant next to it. The bakery next to it. Quiet! Very friendly staff at the reception. Did everything to make my (very) late arrival as convenient as possible. Clean, comfortable, good value. Location is good, parking available. Great shower, safe and nice. 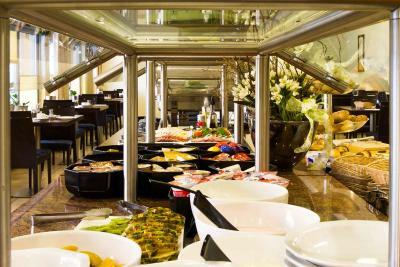 Breakfast buffet was really great. 2 minute walk to a bus right into town was very convenient. Bakery and grocery store with in short walk. The reception lady who waited for us after the hotel closed, the comfort of the rooms, and the delicious breakfast. 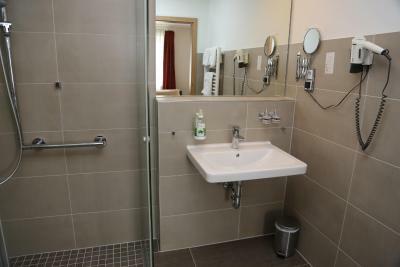 Very modern and well furnished without being fussy. 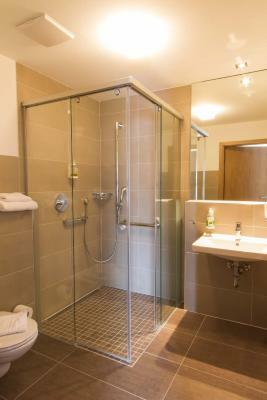 Brilliant shower room. Excellent breakfast and well priced. Petrol station just around the corner which was handy. Fantastic breakfast - it might be because the hotel has a bakery close by... the pastries were excellent. 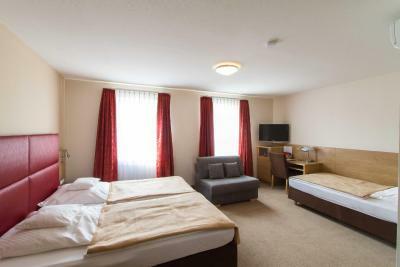 The hotel is clean, looks new, is in a quiet location and relatively close to town (by car). There is also a small bar across the street if you are so inclined to have a beer at the end of the day. The bed was comfortable, breakfast was good, close access to public transportation. Hotel Lindleinsmühle This rating is a reflection of how the property compares to the industry standard when it comes to price, facilities and services available. It's based on a self-evaluation by the property. Use this rating to help choose your stay! One of our best sellers in Würzburg! 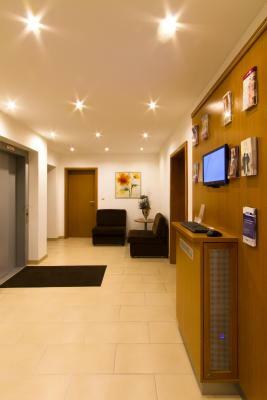 This family-run hotel is peacefully located on the edge of Würzburg, a 10-minute bus journey from the historic center. Free Wi-Fi is available in the entire hotel. 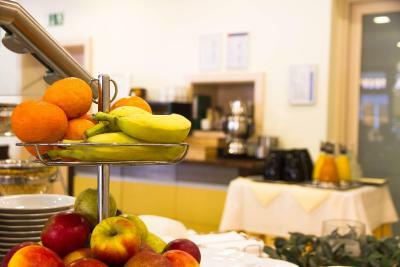 Hotel Lindleinsmühle features modern air-conditioned rooms.The hotel also provides a comprehensive daily breakfast buffet. 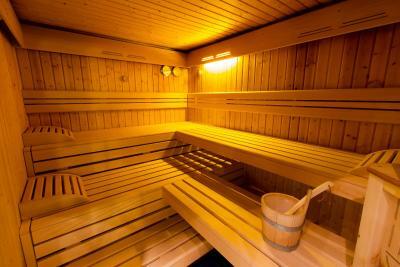 A sauna is available for an extra charge. Guests can also explore the surrounding Lower Franconian countryside on a hiking or cycling tour. 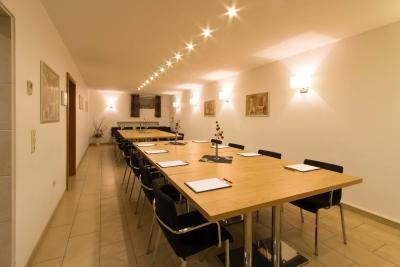 The Lindleinsmühle is an ideal base for exploring Würzburg's historic attractions. These include the splendid Residence Palace, the impressive Marienberg Fortress and the beautiful St. Kilian Cathedral. There is limited free parking available on site and a garage available for a small fee. 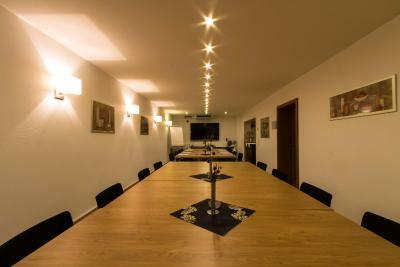 When would you like to stay at Hotel Lindleinsmühle? This air-conditioned room features a TV with cable channels. 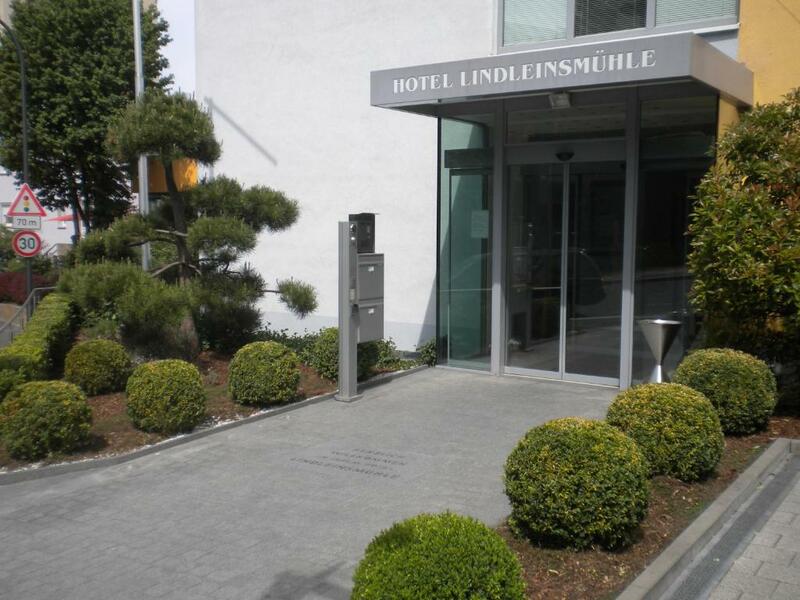 House Rules Hotel Lindleinsmühle takes special requests – add in the next step! Hotel Lindleinsmühle accepts these cards and reserves the right to temporarily hold an amount prior to arrival. Please note that for nonrefundable reservations, payment is due upon arrival. 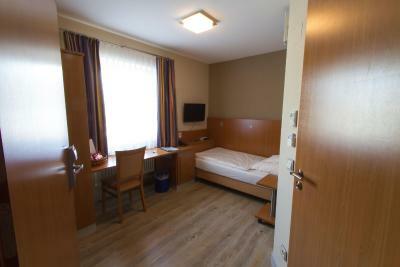 The double room that we booked became a twin room, but in the end that was not such a big problem. The hotel parking is quite limited and it is often required to park on the street. The staff was friendly and they spoke English. The room was clean, everything seems new and in a good shape. The bed was comfy and the pillow fluffy. The restaurant/sports bar next door serves good food. The only thing that would have made our experience better: It would be very helpful if the hotel had instructions online on how to get to the hotel from the train station: Take Bus 12 or 21, get off the bus at Bayernstrasse. A very nice little hotel a little way out of town - but we knew that before we booked. 2 Minutes walk to the bust stop and then about 15 minutes into the city. There is an interesting little local bar across the street where the food looked pretty good. The hotel threw in breakfast which was very good indeed. One have to pay parking outside the hotel. This hotel was a very pleasant surprise for us. We went to the sauna in the basement and after that we came by this relaxing room which has this bench made of mosaic but is heated up. We spent a great deal of time there in that room because it was so comfortable sitting in the heated bench after a long day of driving. The room itself was very cosy as well with the most comfortable mattress we ever had. The lights and the cupboards were to it’s grandest level. Overall we really enjoyed our stay in this lovely hotel. Ground floor room had the window right next to the smoking area at the main entrance. Had to keep windows shut at night to avoid getting the smell in. The parking around the hotel is not the best. If you do it wrong, you risk a fine. 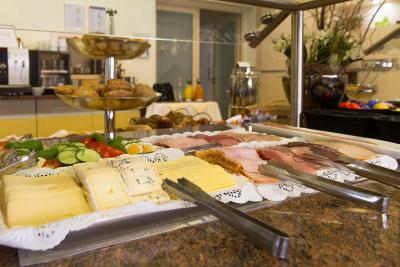 The breakfast was very luxorious, with a broad selection of fruit, cheese, bread and drinks. There is also a bakery across the streat. 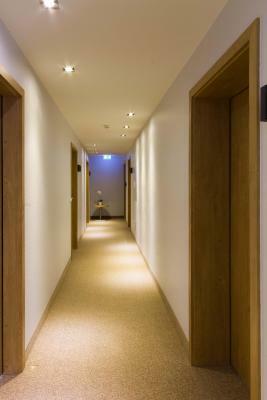 The room itself is tastefully decorated with good lighting. The view is still a bit industrial. I was a late check-in with not enough communication and the friendly staff stayed up, to welcome me. Such a great and unexpected service. 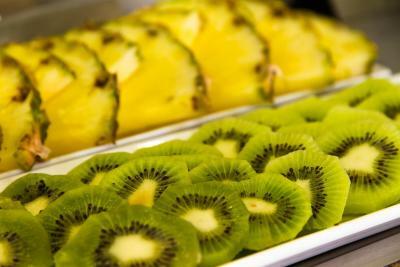 Very nice staff, the hotel was very clean and the breakfast was very nice. Unfortunately the receptionist when we arrived could not give us any information on location, places to eat, etc. The suggested place to have dinner was not as nice as expected. Our room door's extra lock had an issue. But since you cannot open it from outside it was not a big deal for us for one night stay. Room and bathroom were clean. Bed was comfortable. The staff was very friendly. 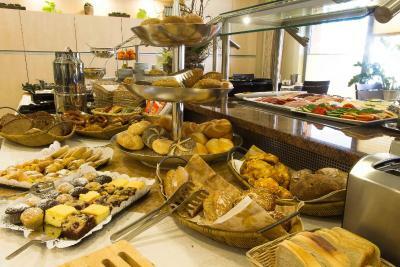 The breakfast was excellent with a huge choice. Noisy on first floor close to entry was at times. 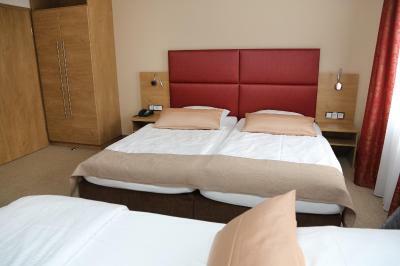 Excellent breakfast, clean room and bathroom, very calm, very comfortable bed.